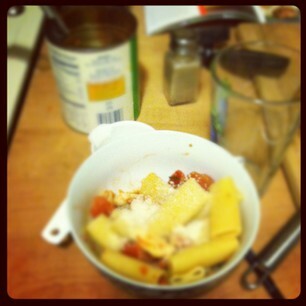 This week, I made another Rachael Ray meal…chicken ragu! I found it in her Look+Cook recipe book, which I have been enjoying. You can also find it online here. I took a few liberties with the ingredients. First, I bought boneless skinless chicken breast that were already cut into little stir-fry pieces to avoid as much handling of raw meet as I could. I also could only find the pancetta that is already thinly sliced, since I live in a grocery dead-zone. I don’t think it made much of a difference as I shredded it by hand. I also had to substitute the San Marzano tomatoes as there was no way I was going to find them within a several mile radius of here. The plum canned tomatoes looked nearly the same as the Google image of San Marzano tomatoes. I started by serving my roommate an amuse bouche of pancetta and baguette (I’m playing pretty loose with the term amuse bouche here). In the future, I would probably use a can of tomatoes that are more sauce like. The ones that I chose I had to hand squish, and they still ended up pretty whole. Overall the dish turned out pretty good, this is one I will continue to work on and cook.